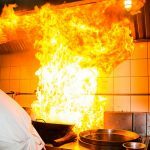 Home » How Do Fire Sprinklers Work? Sprinkler systems are one of the best tools to fight fires. They have been shown to reduce deaths and property loss significantly. Fire sprinklers are activated when a fire occurs and help to minimize property damage. Most building codes require sprinkler systems in new construction and building renovations. But how do they work? Fire sprinklers are not activated by smoke, contrary to popular belief. A fire’s high heat triggers the sprinkler system to begin spraying. Smoke alarms are triggered by smoke and the heat generated travels upwards with it. When the rising heated air reaches between 135 and 165 degrees the sprinkler’s glass bulb filled with a glycerin-based liquid expands. When the liquid expands, it causes the glass to break and activates the sprinkler head. A pipe that connects to a reliable water source outside the building is attached to each sprinkler head. When heat activates a sprinkler head, a valve opens, allowing pressurized water from the pipe system to flow out. The pressurized water allows the water to spray outward in an arc to more thoroughly douse the fire and prevent it from reigniting. Many people believe that all the sprinklers in a system are tied together and when one is triggered by heat, they all activate. This would simply be trading fire damage for water damage. Fortunately, sprinkler heads operate individually. Usually, it takes just one or two activated sprinklers to completely extinguish the fire. This allows water damage to be confined to the area where the fire started. Also, since fire sprinklers use about six times less water than a fire hose to extinguish the fire, it is less damaging to property than a visit from the fire department. Detectors and sprinklers work together to fight fires. Smoke detectors warn, sprinkler systems help put out fires. 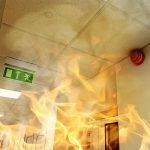 If you need fire sprinklers installed, tested, inspected or repaired, contact Fire Control Systems today.